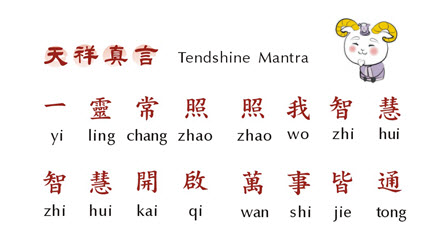 Tendshine Mantra originated from WuSheng Mother (female deity) unconditional loving-kindness and submitted by Tendshine master to God in the year of 2016, has been promulgated thoroughly as “Universe Overall Incantation (宇宙總咒)” in Three Realms and Ten Directions for reverent obedience. Daily devotional chanting and praying Tendshine Mantra with deep concentration can be blessed and inspired by “XuanYuan Aura Energy (鉉元炁能)” spontaneously, infusing from Crown chakra (Sahasrara) into our soul to form a phenomenon of yin-yang harmony inside the body. It ends up manifesting invisible “Energy Balls”, round and full, that varies in shapes according to the prayers’ wishes, for instance, the shape of auspicious clouds, lotus, or medicine package, etc. The “Energy Balls” merits can be transferred to oneself, resonating with the soul of his own, connect oneself with the universe and the Divine source of creation, experience the serenity, joy, wisdom and deep peace. It is absolutely the most efficient and simplest doctrine for cultivator this world. Moreover, the merits can also be dedicated towards either invisible or visible beings, matters, even common occurrences. This utterly ineffable mysterious changes, created from nothing, can only be relied upon personal mind conceptions and devotional practices. Tendshine mantra can not only purify the body, mind and spirit, also attain directly the blessed wisdom from the WuSheng Mother and the Supreme God. An ineffably incredible energy field is made while chanting, which contains both Mother′s and God′s blessings, and also the “XuanYuan Ancestral Aura(鉉元祖炁)” that improves health conditions, and yet achieves the unification of Trinity. It is however an efficient doctrine to rescue the mortals, the spirits, and all other beings. The practitioners can gain the blessed wisdom, remove their karmic hindrances only by chanting it and transferring the merits to ones whom they wish to dedicate to. In addition, any believers can chant it and do the dedication to worship their celestial being regardless of religions because it possesses synergy benefits. On the other hand, the mantra can assist us in inspiring our inner “Divinity” (higher self) which purifies the toxins within our inner “Humanity". When the former is superior to the latter, your ego gets lowered, then the arousing positive energy from the bottom of your heart can adjust personal behaviors, walking into the light of altruism, consequently evoking the “goodness” in every form around us. It is important to circulate it to attain true happiness and well-being in life, coming up with sooner or later an auspicious family, society, and country.